I'm always looking for a fun DIY gift that people will actually WANT and not just toss in the Goodwill box come December 26th. This one is perfect for all ages! You can control the "portion" size, scent, packaging, etc! A perfect DIY for friend's gifts, a birthday party or a girls night. These are easy and relatively inexpensive! The number you will get per batch is determined by the size "bomb mold" you use! Bonus, you'll smell great and your hands will be nice and soft! essential oil of your choosing (I used peppermint and lavender, separately) I used 10-12 drops per batch but it's really up to you. 1 drop of food coloring per batch. Too much and you'll risk turning yourself colors! 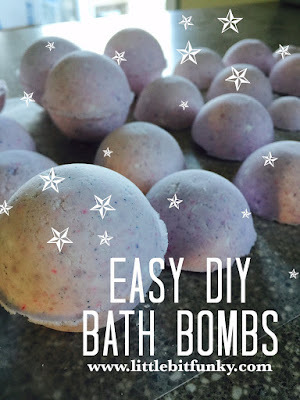 Bath Bomb forms Do NOT use the recipe that comes with it! You could also use ice cube trays of any shape or a measuring cup in whatever size you'd prefer. It's useful to have a pastry cutter (shown above), you could also use a sturdy whisk. Combine dry ingredients using a whisk. In a separate bowl combine coconut oil, food coloring and essential oils. Now, S L O W L Y add dry ingredients to wet, whisking the whole time. Too fast and you'll cause a chemical reaction. Go slow. Once they are all in the same bowl, use your sturdy whisk or pastry cutter to continue to combine them. You don't want any big lumps, you want a consistent wet sand kind of look to it. You can also use the rubber spatula to smoosh the lumps out and fluff it up again with the cutter. Once all the ingredients are combined grab your forms! Fill and press together tightly using the rubber spatula. Use those castle building skills you had as a kid! Fill, press, fill, press, fill, press...once it's full you can gently remove it from the form onto wax paper to dry overnight or for a full 24 hours. I made a few sizes...the full "BOMB size", for those kind of days... half size for when you only have a little time to get away and these little ones shown above for when your kids inevitably want to use them. I made this size by using a tablespoon as a mold. They are the perfect size for little kid fun! A couple of them package nicely together in a treat bag. The little ones are super cute in a mason jar too! These are great for any holiday! I hope you have fun make them! My daughter loves bath bombs, but they can get pretty expensive! Definitely going to add these goodies to my Amazon cart ASAP! Thanks for the suggestions.